Do you want to batch process camcorder footage such as AVCHD MTS/M2TS files at one time? 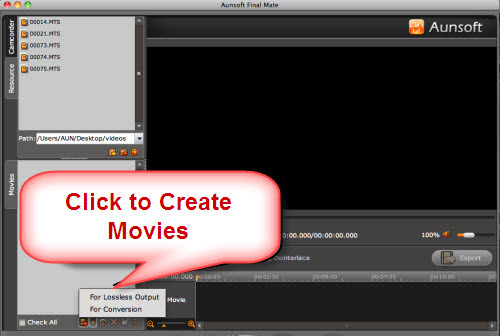 Or you may want to make some basic editing like joining, cutting and then output the movies for different usage. The guide introduces who to batch handle AVCHD MTS/M2TS footage at one time, one for lossless output, the other for transcoding to other formats. Aunsoft Final Mate for Mac, the ultimate camcorder companion for Mac users, help capture AVCHD footage from camcorder, edit MTS/M2TS files on Timeline, lossless output your memories or convert to other Mac friendly formats, such as Apple ProRes 422 Codec or AIC. How to Batch Process AVCHD Footage on Mac with Final Mate for Mac? Please follow the step by step guide below. First of all, free download trial version of Final Mate for Mac and then install the software on your Mac computer. You can launch the app from Application folder. 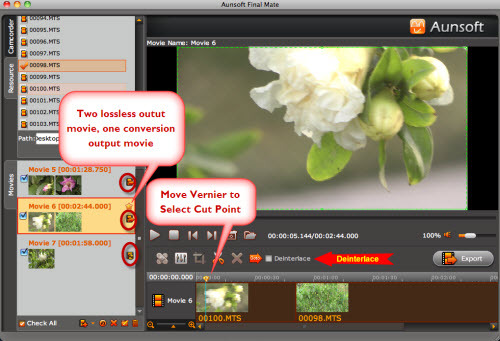 There are two ways for you to add AVCHD footage to Final Mate for Mac. The first way is to import files from camcorder, the other is from computer. If you haven’t copies your AVCHD footage to your computer, you can directly connect your camcorder to your Mac machine and launch Final Mate for Mac to capture AVCHD footage. Follow included camcorder wizard to easily transfer MTS.M2TS videos to the program. Imported videos will be listed in Camcorder Tab of Final Mate for Mac main interface. Or you can add AVCHD footage from your computer. In this case, just launch Final Mate for Mac. Click Resource Tab and select a path from the drop-down list of “Path” , then all AVCHD videos saved in this path will be automatically listed in Resource Tab. 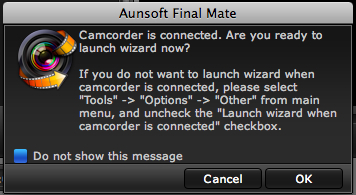 The AVCHD videos shown in Resource Tab are available for further editing in Final Mate for Mac. Final Mate for Mac is able to batch process AVCHD files at one time, one for lossless output and the other for conversion. To create movies for two different purposes, please click on Create Movie button in Movies Tab to choose the type of movie you want to create. Click “For Lossless Output” to create a blank movie for lossless output without re-encoding. And click “For Conversion” to create a blank movie for conversion. 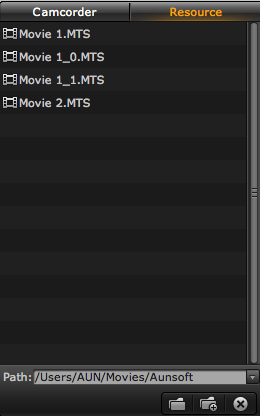 After you’ve created movies, you can drag and drop files from Camcorder Tab or Resource Tab to the blank movies. 1) A movie represents an output file. So if you want to join multiple AVCHD clips into one, just drag and drop files to one single movie and all files will be merged as one video. 2) For lossless output movies, please make sure that all your files imported to this blank movie are of the same format (MTS or M2TS) and parameters (such as frame rate, resolution, etc). Double click a AVCHD movie in Movies Tab to select and highlight it in the Timeline. Then you are able to make some basic editing, such as split, trim, crop or replace audio file. Note: About lossless output movies, you can only split or cut the scenes. For other editing features such as video restoration, audio replacement, they are not available. But for conversion output movies, all the editing features in Final Mate for Mac are available. Click on Export button and you can find output details on Export window. It will list the number of lossless output movie and conversion output movie. 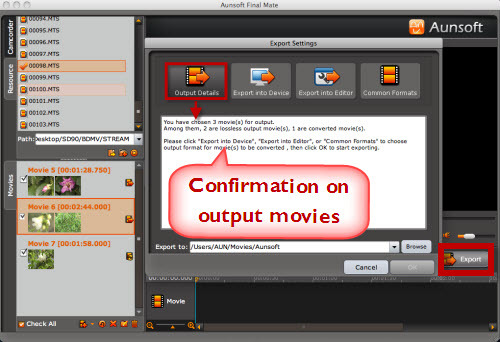 After confirming your output details, please click on Export into Editor, Export into Device or Common Formats to choose output format for movies to be converted. 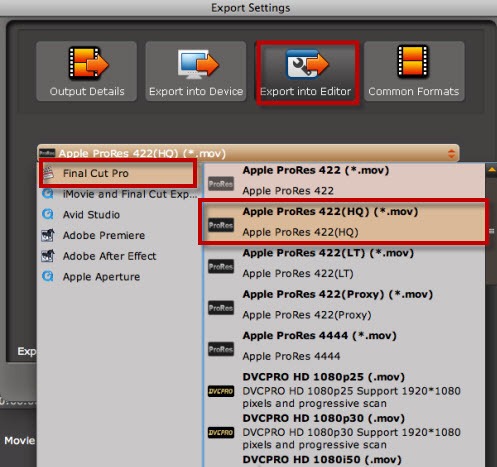 In this case, I follow Export into Editor > Final Cut Pro > Apple ProRes 422(*.mov) to convert AVCHD MTS/M2TS movies to Apple ProRes MOV format for further editing in FCP. Once you’ve chosen your output format for movies to be converted, click ok to start exporting your movies. 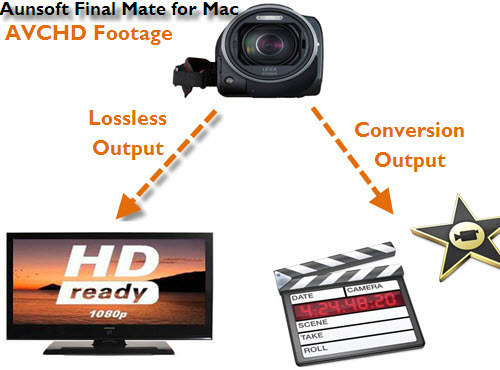 With Final Mate for Mac, you can easily handle AVCHD camcorder footage in batch, either lossless joining/splitting files for playback on HD TV or convert MTS/M2TS files to Mac friendly format such as Apple ProRes 422(*.MOV), Apple Intermediate Codec(*.mov). Tip: If you are a PC user, you can choose the correspondent product Aunsoft Final Mate for batch handling AVCHD files on Windows platform.